By David Blevins | Aug. 12, 2010, 2:15 p.m.
New York City based Celtic rockers, Black 47, is the main attraction this week at Nightfall, with opening act, Id and the Superegos. For a group that has seen 20 years on the road, Black 47 shows no signs of wear as their politically charged lyrics and self-defined Celtic sound continue to inform, intrigue and inspire. The name Black 47 is in reference to the year 1847 and the Irish Potato Famine. This time period would forever change the political and economic landscape of Ireland, so it seems appropriate that a band that is focused on examining factors of political and social change gives a nod to arguably the strongest catalyst in Irish history. The band provides a comprehensive experience for the listener in that not only do the members exhibit a mastery of multiple instrumental approaches including rock, reggae, hip-hop, folk, Irish traditional, downtown noise and jazz, but their lyrics are carefully crafted stories that have a poetic legitimacy that is signature of quality literary works. Each song could be considered an entertaining history lesson, and it is no surprise that in Black 47's two decades of existence, the band's words have been instructional material utilized in high schools and colleges across the country. Look no further than frontman Larry Kirwan (lead vocals and guitar) for a logical conclusion as to why the lyrical development itself could stand alone as a work of art. In addition to his Black 47 responsibilities, Kirwan has written 11 plays and musicals, and he is a published novelist. Joining Kirwan on stage will be Geoffrey Blythe, tenor and soprano saxophone; Joe Burcaw, bass; Thomas Hamlin, drums and percussion; Jospeh Mulvanerty, Uilleann Pipes and flute; and Fred Parcells, trombone and pennywhistle. 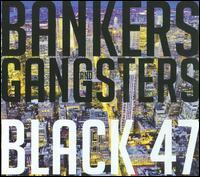 Black 47 recently released its 14th album, Bankers and Gangsters, which explores a variety of socio-economic issues, with a bit of cynical humor, while maintaining the thoughtful nature for which the band is known. Celtic rock band Black 47 headlines this week's Nightfall Concert Series. Chattarati is licensed under a Creative Commons Attribution 3.0 United States License. Non-original content remains in the copyright of the original publisher. Background images provided by the Chattanooga Area Chamber of Commerce.